Living in a small space has a lot of perks – you have fewer items to worry about, you tend to know where everything is, and it takes much less time to clean 60 square feet versus 1,000 square feet. With adventure comes dirt, mud, sand, and all kinds of little critters. Here are some Campervan storage ideas and cleaning tricks to ensure a tidy van as you travel around! The most common cleaning tools you will see in almost every van are a hand broom and a dust pan. Fortunately, these are inexpensive. Why a hand broom, specifically? Well, when your home is less than 100 square feet, you don’t want to take up a lot of space the way a full-sized broom would. Another perk to these guys is that they can clean every nook and cranny of your van with no hassle! Imagine using a full-sized broom to wipe off your counter top when you’re working with only 60 square feet of space – quite the comedic act! Instead, you can just brush the counter crumbs onto the floor, and sweep ‘em right out of your van or the dustpan. Something we recently decided to “splurge” for was a 12V vacuum. 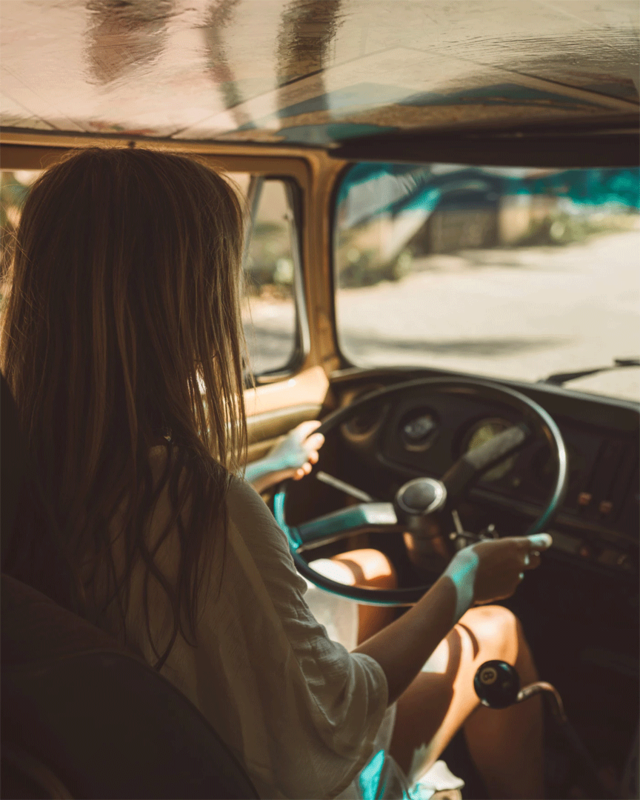 Too many times we have found ourselves in situations where we would start driving down a very dusty road only to realize that we forgot to shut a window or two. Within seconds, the whole van would fill with dust! This has actually postponed some of our travel plans in the past because we ended up spending the subsequent three hours unexpectedly cleaning out the entire van with just our hand broom. Now if these instances occur (fingers crossed that it happens far less than it did last year! ), it will take us much less time to clean up the van and carry on with our adventuring thanks to our new helpful cleaning buddy! These guys normally use minimal power, and are pretty compact, too. We have a small area in our trunk where we are able to tuck it away. When we were building out our van, we were very conscious of every nook and cranny and how we could utilize it as a storage area. If every item already has a home, it is much easier to keep everything clean and tidy. When we bought our van, it had a TV/VCR/media center in the space above the cab, and small storage cubbies in the high top above the back seat. We gutted both of these areas and rebuilt them into spacious storage areas. The space above the cab is now our pantry for dry foods and goods, and the area above our bed has been transformed into our clothes closet. We built our kitchenette to hold all of our kitchenware, not just our sink, water and stove. We made sure to build an area that would hold our pots, pans, plates, forks, and any other cookware goodies we need! Helpful trick! Get pieces of PVC pipe and cut them into 3”-4” lengths, and then cap off the bottom. Mount these wherever you wish and voila! You have mounted silverware holders! We also realized that when the doors to our van are closed, there is a lot of dead space where the step of the van is. Since the space wasn’t being used for anything, we saw it as a great opportunity to add even more storage! We mounted storage boxes on each door: one to hold our trash and recycling, and another to hold all of our dogs’ items (dog food, toys, meds, cooling towels and more!). Unfortunately, this won’t work very well if you have a sliding door, but it works really well for barn-style side doors! Finally, whether you are building your van, or bought one built out like a Westy, there are plenty of items you can buy to help you give a home to your belongings. For instance, we have a hanging basket behind the driver seat that holds most of our fruits and veggies that don’t require refrigeration. One of my favorite campervan storage ideas, we have baskets filled with random glass and metal jars that help us keep our pantry more tidy and organized as well! Make sure everything you travel around with has a home. We don’t just throw our books wherever we can. We have cubbies on each side of our beds specifically to hold them for us. When it comes down to it, being conscious of any mess will help you the most in keeping your home on wheels clean, tidy and well organized. We have shelves near the ceiling, and each section of the shelf has its own category. One section holds our travel games, while another area is for first aid; one part may be for spices, whereas another part may be for cleaning supplies. Having a home for everything is going to save you time and stress down the road. We know that this sounds like something you repeat to a toddler when their room is a mess, but the truth is it’s one of the most useful campervan storage ideas because it actually works. We learned this lesson the hard way when it came to cooking meals in our van. We LOVE epic, elaborate meals. But if we wait until we are finished eating to clean everything up, not only are we fighting our food comas and avoiding anything productive, but we have about 10x more mess than we would have had if we’d just cleaned up items as we went. Done chopping veggies and waiting for water to boil? Clean the cutting board and knife and put them away! Simple. Helpful trick! Look into one-pot meals! They are a game changer when it comes to reducing the amount of clean up you have to do during or after a meal! 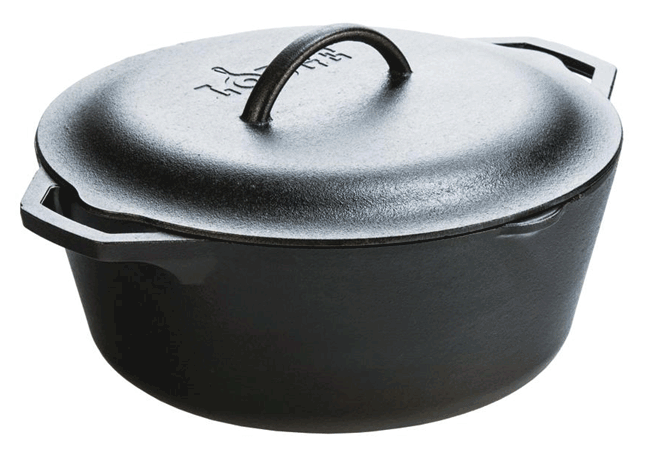 A must have Vanlife tool for one pot meals, the versatile Lodge Dutch Oven will you tons of time and effort. Click to see options and pricing on Amazon. Enjoy Your Clean and Tidy Home On the Go! These are the tricks that we use day in and day out to help keep our home as nice and neat as we prefer. We always feel better when our living environment is a bit more put together throughout the day. Also keep in mind that the less waste you create, the less you have to clean up later. There are so many ways we can actively work to create a cleaner living situation for ourselves! What tricks have you found work best for you in your home on wheels? Please take a minute to leave a comment, ask us a question or just say hi! We are Jayme and John from Gnomad Home, traveling around with our two pups in our 1996 Chevy Express conversion van we built into a tiny home on wheels. We produce free van build information for anyone wanting to build out a van but not knowing where to start!